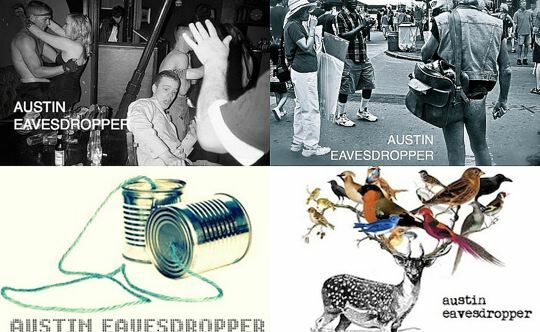 Austin Eavesdropper: "So, what's your blog about?" Ah, longtime Austin Eavesdropper readers. Mom, Dad. A collage of my old blog headers, plus a little taste of the next header. This blog has been through so many changes, and the header is only the beginning. If you attended SXSW last week and do in fact blog, I'm sure you got this a lot. Whenever I go back and read my old, old posts, like from 2008, all I can think is: "Who is that silly, wannabe party girl?" Reading your old blog posts is a little bit like looking at pictures from high school. "Did I really dress like that?" you think. "Why did I think that hair style was cool?" At the time, you think you're making all the right moves. And then, when you've grown up a bit, gaining distance and hopefully perspective, you're able to see the old you through a clearer lens. It can be uncomfortable at times. "HEY DO YOU WANT A BEER I'M GOING BACK TO THE BAR OH YOU HAVE A TAB? PABST? WAIT YOU HAVE A TAB OR YOU WANT ME TO GET YOU A PABST?" I attended less shows. A lot less. Instead, I decided to station myself at a few places, and talked to more friends. Friends I have known, and friends made right there on the spot. Among the latter, a few asked: "What's your blog about?" There was a time when I knew how to answer this question. "Austin nightlife!" I used to say, and leave it at that. 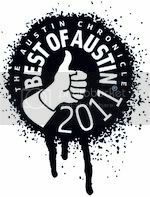 Eventually I amended it to, "Austin nightlife and events!" which was even more vague. But then, somewhere around 2009, I started gaining more focus. A posting pattern began to emerge. I realized that my posts fell into roughly four categories -- local music, fashion, food and art -- and following the advice (i.e. exasperation) of fellow bloggers, made little margin labels for those things. And THEN, much more recently, I decided to get personal. I began telling more stories. And putting some effort into crafting them. Stories that had nothing to do with music, or fashion, or food, or art or even Austin, except for the fact that I live in Austin, so at least there was that. And it's funny. I always thought that the only reason people read this blog was to find out what was going on around town. Then those posts, the personal ones, ended up getting a lot more interest, though I didn't know people even wanted to hear about that stuff -- my baby neuroses, my alcoholic friend, my go out/stay in dilemma. But it made me extremely happy, that people read and commented and cared. This all leads up to an extremely garbled explanation I offered at a SXSW fashion blogger brunch on Wednesday, when a clothing designer asked me that dreaded, awful question. "So, what's your blog about?" "It's, like, local discoveries that I make?" "Combined with some of my more personal writing?" "I mean, I focus on music/food/fashion/art, mostly here in Austin, but lately I get the most excited about telling stories? Sort of doesn't matter what the topic is?" "Because, well, I'm not a great photographer, I shoot video sometimes but it's just ok, so I guess it's mostly me writing about stuff? 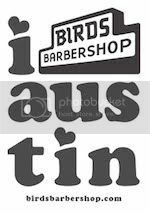 Austin stuff but also just 'me' stuff?" At this point she stopped listening. Returned to her egg white omelet with a decisive lift of the fork. I couldn't blame her. Do you know who I am in awe of? Style bloggers. They have lasor beam blog focus. Good at photography, good at marketing, good at everything. Also, food bloggers. Who's more networked than food bloggers? Probably no one. Any blogger who possesses a single, catch-all, categorical net: This is who I long to be sometimes. I often think, "maybe it would be better to just pick something, JUST ONE THING, and start a new blog about that one thing." Sweet potatoes, maybe. I really, really like sweet potatoes. But in the end, I always keep Austin Eavesdropper. Even though I don't "get" Austin Eavesdropper. Chances are, you don't either. I'm just immensely grateful that you are here, reading, going along on this little journey with me. Chronicling your late 20s (and beyond?) is a bizarre task, but I feel really lucky that I get to share it here, and talk about it with people. 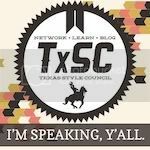 At SXSW last week, I realized this blog doesn't know what it wants to be when it grows up. Hell, I don't know what I want to be when I grow up. And maybe that's ok. As long as you'll have me, I'll keep trying to figure it out. I had a long convo w/ someone the other day about how some bloggers get SO many comments (and how jealous I am of them, hehe) - and yours was the first that came to mind. And it's not hard to see why: Every one of your posts is an intimate personal conversation with the reader, and whether or not it's about nightlife or something much more serious, I love your blog b/c I always leave feeling like I connected with TOLLY! It was much easier to explain to others when I had a dining blog. The problem was that there was so much I wanted to write about that didn't fit into that category. Your voice is an ever evolving thing. Like the person writing it, it shouldn't be put in a box. hee hee. oh man. i could write a post about this too. doesn't help that i'm still half ashamed to tell people that i'm a blogger. i think it sounds cheesy. however, i just need to own it and to not say, "well...my blog is kind of about this, but also kind about this...and, oh, i don't know!" Wait, this isn't about bird-antlered deer? No one has it figured out. Even style bloggers don't have it figured out and I bet if you asked them they'd say they wish they could do a little more of this and a little more of that. The grass is always greener you know. I love your blog because it's totally down to earth and very approachable. Even though I've never met you I would bet those sentiments would describe you as well. Totally down to earth and approachable. I absolutely love the fact that you aren't "laser focused" in your content because honestly that gets boring. I prefer to have a little of everything in one place and you do that quite well. Anyway, all I have to say is whatever you are doing you're doing it right. I like reading your blog. It is always interesting and provides a variety of topics. There is a real person behind the writing, which I like. While I read some more topical blogs: food/fashion/whatnot- visiting Eavesdropper is a surprise every time. My blog is about margaritas- which is easy to explain! Except it doesn't provide much depth intellectually...it started as a sort of joke about the uber-focused blogs. But I feel a sort of panicky confusion when asked, "What do you want to write about?" when I mention I write stuff other than shallow drink reviews. "You know...LIFE?" isn't a good conversation starter. 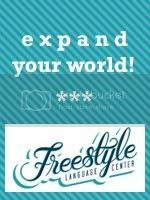 I've heard people refer to blogs like yours and mine as "lifestyle" blogs since they encompass a wide variety of topics from personal experiences to local events to recipes, outfit posts, home photos, etc etc. I think that term sounds a little narcissistic, but I guess blogging in itself is sort of narcissistic so it works. I've been trying to focus my blog a little more now too and it seems so difficult! Especially when your interests and hobbies are so diverse. I don't think you need to narrow it down to just one thing. I love all of the Austin events that you post and even before I lived here, I liked reading about them. I also love, love, LOVE your personal stuff (like that one about the skinny dipping) and hearing about you looking for a house or Ross going off to the jungle. When my blog started out, it was mostly about music but I started writing personal stuff too and I sort of like that it's a mixed bag because there's more to me than being a music lover/nerd. Just keep doing what you are doing because like you said, people obviously keep coming back for a reason, even if you can't pinpoint it. Eh, there are zillions of us style bloggers out here, and there's only ONE Tolly Eavesdropper. So there. i agree with above sentiments. this blog is about tolly, and i'm fine with that. you rule. My dear you took the words out of my mouth! A blog is a everchanging almost living thing. It grows and changes sometimes unbeknowst to even the writer. My own blog started as quite a different thing. The pictures...eghhhh! I was thinking only friends and family would read it. But now I have people who read my blog regularly from all over the world. Now it's still a mystery to me how to get them all to comment more regularly. But I now have a desire to connect to readers even more. I've only had a Twitter and Facebook page for my blog for only a few weeks and already more people are trickling in. The answer I give people on what my blog is about: Its my creative outlet and place to share all that I find interesting and inspirational in the world. My connection. And sometimes its a place to tell people of that funny thing you saw or did. Make people laugh even if its at you. Some days its what I cooked, some days its what I wore,what I read, saw or did. Superficial or not I connect with people every day that feel, said, or did the same. I love you Tolly! Don't ever change, we love takin the ride with you! Tolly, I read your blog because your eloquence is mesmerizing. When you tell a story, you don't just tell it, you put it in your perspective, through and through, and I feel like I'm hearing this from an excited friend, though I've never met you. I don't even live in Austin (yet)! Your style of writing is down right adorable, which keeps me hooked. You give me hope that maybe someday I can write about whatever I want and see others enjoy it. I love the variety of content, because I'm learning ALL about Austin right now. Seriously, all of it. Just keep doing what you're doing. I understand your dilemma. I started SoManyBands as a music blog, but lately, I've been covering film, gadgets, news, etc. It's not just music anymore and I don't know how to put that out there without revamping the name. As far as your blog though, I wouldn't know how to categorize it. It's basically your personal blog documenting all the fabulous moments in Austin. You've attended style events, music festivals, film screenings, etc. You're basically living the life a lot of people dream about. You're very in tuned with the Austin lifestyle. Thank you for all of this feedback!! Right after I clicked "post," I realized how needlessly whiny it may have all sounded -- however. You guys kindly overlooked that and wrote the most encouraging, affirming things. I don't just Facebook like y'all. I LIKE y'all like y'all. @Sarah, you mentioned living a life that a lot of people dream about. And you know something? You are right. I have to pinch myself sometimes that I get to live here, in a city steeped in creativity. Remember when we were walking out of The Runaways screening that one time, talking in the Drafthouse parking lot? That was distinctly one of those moments when I thought, "this is badass. Seeing that movie. On a work day. For free. Talking about it with a cool chick." So, thank you in particular for that reminder! Plus you really make me laugh. I enjoy your sense of humor (if I'm reading it correctly)! Your blog is just real. And you have a style of writing others only wish they had. Somehow the true YOU comes out in every post. That's what brings me back. So many of the things you write I think in my head but would never think to articulate them on paper, and certainly not as eloquently as you do. In this post alone there are two things I totally relate to - being envious of the laser-beam focus fashion, food, etc. bloggers, and wondering about blogging beyond your late 20s. Love that about you. PS Love the SX pictures. You look AMAZING - so toned! Aww thanks for the kind words Tolly. I have to admit I was nervous to approach you. I'd been a reader for awhile, and I always get this mentality when I meet known bloggers and musicians in town that they already know it and see me as a measly wannabe. Anyway... yeah, it blows me away that we get the opportunities to do what we do. I read this whenever I wonder 'What Tolly is up to?' or 'I can't find that text with the vegetable recipe'. Hey Tolly, I happened upon your blog by hitting the "Next Blog" button, and your stubborn heading wouldn't let me go any further. So, I decided I might as well take a look around, and your blog about becoming a new homeowner caught my eye--I was hooked. Honestly, in that one blog you did something writers take years and years of classes trying to accomplish...you have the power to communicate. And not just communicate the busy happenings of life, or giving the play by play of getting from point A to point B, but something that ripples through to the human spirit. Raymond Carver once said, "Anyone can express himself, or herself, but what writers and poets want to do in their work, more than simply express themselves, is communicate, yes?" So, that's why I clicked the "Follow" button and took a seat next to the other 480 in your audience. Your's was one window I peeked through that made me want to come on in and stay for awhile to listen to the life behind your literary voice. @App4Life -- I read your incredibly kind comment yesterday, as I was nearly walking out the door, and loved it so much I had to open it back up and ruminate on it some more. First of all, thank you so much for your kind compliments. Have to say that even your praises for OTHER writers are quite artful! Secondly, it's wonderful to have this tool, non? Public writing, I mean. As a blogger yourself, you understand. I feel very fortunate to have been born at precisely the historical moment when writing for others no longer requires a gatekeeper (like a book publisher or magazine editor), but also hasn't reached a saturation point of blogs. If such a thing is ever possible. Anyway, I am now headed to your blogging home, where I will no doubt have the pleasure of watching another writer hone her craft! Thank you again for your thoughtful (and very well-timed) comment. :) Not too heavy at all. Last night I watched the movie, Midnight in Paris, and in it, a character who is supposed to be Hemingway says, "A great writer is one whose stories are real and true." Maybe he wrote that in his books? I wouldn't know because I have honestly never read Ernest Hemingway literature; I don't read much. I admit that because it is true- ashamed as I am. But Tolly, I do love to read... your blog! You are real and speak the truth. This is the best way I can answer your question at this moment :).